Konovalov Vyacheslav Aleksandrovich was born in 1978, in Moscow. In 2001 he finished the faculty “Economy and management” Moscow State Technological University named after K.E. Tsiolkovsky with a major in economist-manager. Vyacheslav Konovalov has been embarking upon a career when he was the first year student. He has been working at SNPO “Eleron” since 2000. He has risen from a Deputy Head of Section to the Chief Executive Officer. His executive experience is more than 15 years. 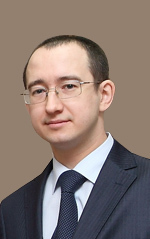 Vyacheslav Konovalov was awarded the following sectoral honours: Award pin “Academician I.V. Kurchatov” the 4th and the 3rd Class.